SIIJLA invites you and your family to commemorate Muharram 1440 at our center. Our guest speaker this year will be Sheikh Mohammed Ali Ismail from the United Kingdom. The day of Ashura will be on Thursday, September 20th (subject to moon sighting). 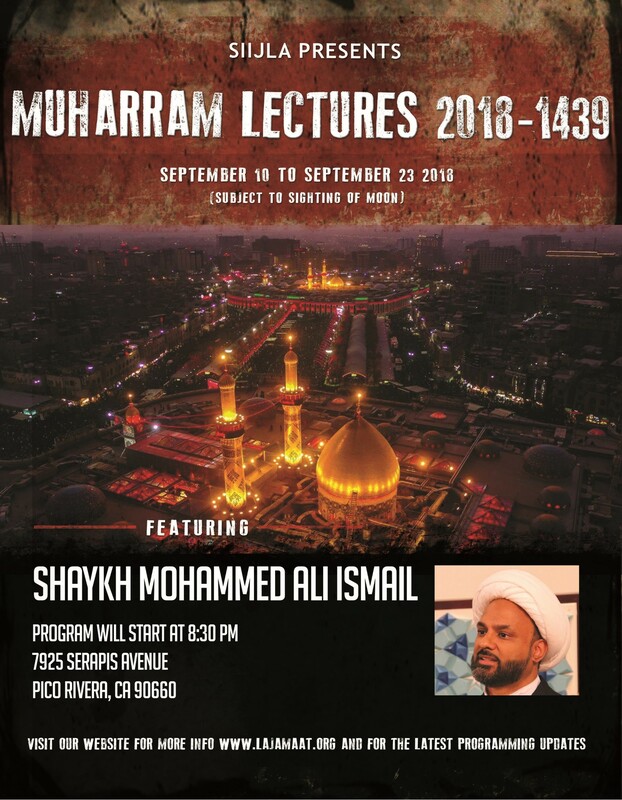 SIIJLA will be conducting a Muharram Kids Workshop for children ages 5-12, starting Friday, September 14, 2018. If you are interested in leading a workshop, please contact Sr. Nazneen Nathani Mirza (nazneenn@gmail.com). Lessons and materials are provided thanks to Kisa Kids! Anyone wishing to participate in the recitation of dua/poetry/eulogy/Marsia/Matam during these upcoming programs please contact Br. Jamil Jaffer at jamil.jaffer@gmail.com.